For a change, this report is not about any special trip I did, or place I have been, but is simply background info about life in Bangkok! Anyone who has heard of Bangkok, has heard of the traffic problems, so I thought I would write a few words about transport in the capital city! 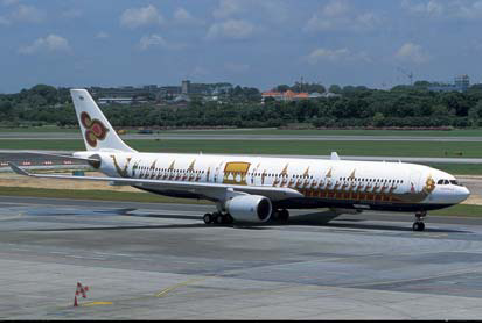 Bangkok has one of the busiest airports in Asia, and Thai Airways one of the most comfortable fleets of aircraft. My flight here started in style, and with surprise … the plane was painted to look like one of the royal barges! Most national airlines fly into Bangkok, and there are a number of Domestic airlines such as ‘Bangkok Air’ that fly from Bangkok to other cities and islands within Thailand. As planes are expensive, most Thais use trains for long journeys. On my winter trip, the main journey South (and back) was taken by overnight sleeper trains. These are quiet, comfortable, and use a great system of seats that fold to make beds! With the river being so important in Bangkok, there are plenty of river taxis, and boats to hire, the most popular being the long-tails. There are also the "cruise" boats giving dinner cruises in the evenings, and the traditional rice-barges, now used as educational boats for school groups. This is also a great way to beat the traffic! Opened only two years ago, the BTS Sky train has proved a revolution for Bangkok traffic! Basically this is an "underground or metro" type solution, but runs on elevated tracks above the roads of Bangkok. Clean, quick and air-conditioned this is THE solution for being traffic jams! Choices are plentiful! Buses are cheap, and there are air-condition buses for an extra cost. Taxis are in unlimited supply, both "normal" metered cabs, and the famous local tuk-tuk (basically a three wheeled motorbike with a seat). Motorbike taxis also abound, particularly on the smaller streets and sois, great at weaving in and out of the endless traffic jams, as long as you don’t put too high a value on life!